From the IEP Wizard Quick Resume Menu, select IEP Wizard Follow Up Details. NOTE: Only those items with a red asterisk MUST be completed. The additional items are optional and for students who may have services provided at a different entity than the entity offering FAPE. 1. From the drop down menu select the person responsible for implementation of the IEP (e.g. Special Education Teacher, Teacher, Principal, School Social Worker, etc.). 2. Using the drop down menu select the entity offering FAPE. Note: This entity will transfer to the Notice of FAPE PDF as the entity offering FAPE. 3. 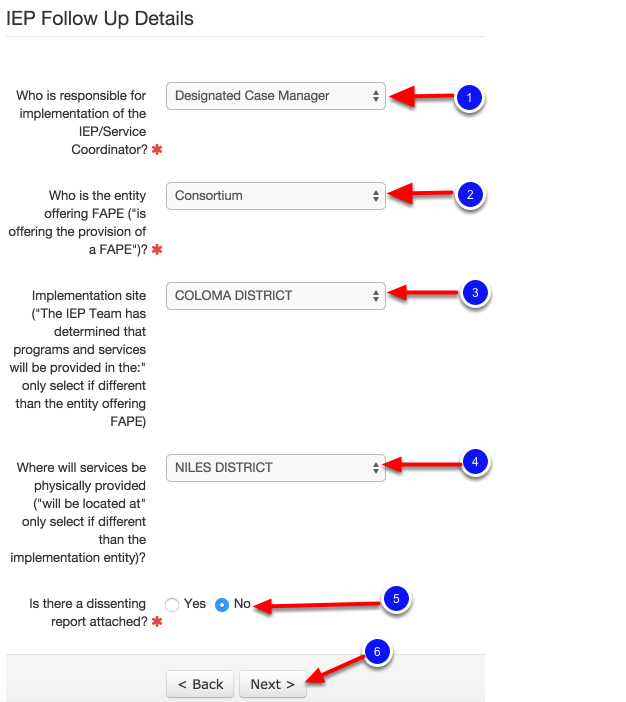 IF services will be IMPLEMENTED at a different district than the entity offering FAPE select this from the drop down menu. OTHERWISE LEAVE BLANK. Note: This data will transfer to the IEP Wizard Notice Page as the Operating District. 4. IF services will be PHYSICALLY PROVIDED at a different placement than the implementation entity select this from the drop down menu. OTHERWISE LEAVE BLANK. Note: This entity will transfer to the Provision of FAPE PDF as entity where the programs/services will be located in. 5. Indicate whether a Dissenting Report is attached to the IEP by selecting Yes or No. Where Does the Information on the Follow Up Details Page Transfer to? Where Does the Information on the Follow Up Details Page Transfer to CONT. You are now ready to complete the IEP Wizard Notice page. For more information on how to complete the IEP Wizard Notice page see the, "Notice/Provision of Services" lesson in this manual.